← Low Fat Salad Dressing! Most take-away food stands in Mexico and several taco trucks on the west coast of the United States include horchata (pronounced “or CHA ta”) with their beverage choices. When I first saw it I was a bit skeptical. It has a milky appearance and is usually contained in a huge glass barrel and doled out using a large ladle into plastic cups filled with ice. But the second I tasted it I was hooked. Its sweet creaminess provided the perfect relief from the hot afternoon sun. Horchata varies throughout Latin America and each country utilizes unique flavors. Every location seems to have their own version – making use of everything from ground seeds and nuts to rice and other grains. In Mexico, horchata is always made with rice and cinnamon and from time to time there is a hint of vanilla. 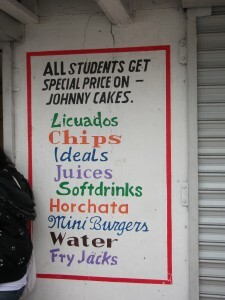 Puerto Rico, Venezuela, Nicaragua and Honduras also serve horchata but flavor it differently depending on the country. Horchata, together with tamarind and hibiscus flowers or jamaica (pronounced “huh MY ick uh”), are the three typical drink flavors of Mexican aguas frescas. Though it is available in both ready-to-drink (shelf-stable or refrigerated) and powdered form in many grocery stores throughout Central America, my daughter learned how to make it from scratch. She used turbinado sugar from the tiny grocery store close by and we made tray upon tray of ice cubes to cool it down. It’s quite simple and can be made in large batches to keep us cool on hot, sticky days. My grandson had a permanent horchata moustache on his face – asking for this cool drink (which he called hor-chakka) every time he returned from the beach. Make a simple syrup by combining ½ cup sugar with ½ cup water in a saucepan and bringing to a simmer until the sugar dissolves. This can be made in advance and stored in an airtight container in the refrigerator. Check your rice for debris and rinse it well under cold water and drain. Put washed rice with 2 cups water and ground cinnamon in the blender along with the simple syrup (above) and blend on medium high for 1 minute. Add remaining 3 cups of water so it all gets ground together. Let sit at room temperature for at least three hours or refrigerate this mixture overnight in a covered container. The next day or three hours later, strain the mixture and discard the rice. To the remaining liquid, add the milk and vanilla. Keep refrigerated until ready to drink, then stir well before pouring and serve over ice. Horchata is such a refreshing drink and is the perfect accompaniment to spicy foods! This entry was posted in Beverage, Central America and tagged Belize, Horchata. Bookmark the permalink. Thanks for sharing this recipe. I love Mexican horchata, but I never knew how to make it. One question: could you explain the reason for letting the rice mixture sit for several hours before you drink it? I am pretty sure it is to let the flavors combine with each other, and to let the starch from the rice form with too. You could try just straining and drinking some right away, then leave the remainder sit and compare. I find some of the things folks do cooking-wise in other countries make no sense. For example in Central America they always wash the raw chicken with lime juice or vinegar. I always skip step.